The Supreme Guzzler Waffle Weave Drying Towel is a soft waffle weave towel with a strip of silky soft satin sewn around the edges. The satin is just one more safeguard against swirls and scratches because it covers the stitching at the edge of the towel. 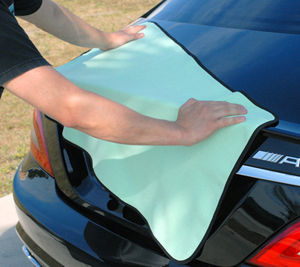 As you dry your vehicle, the satin-edge towel glides over the paint, soaking up every drop of water. Dries larger panels in one swipe! The Supreme Guzzler Waffle Weave Drying Towel features a plush, 80/20 waffle weave that increases its surface area for greater moisture absorption. The towel can absorb 7 times its own weight in water! In fact, this towel is 20% plusher than our other waffle weave towels to give it even an even greater capacity for moisture! This amazing fabric was created in Korea and then cut and sewn in China to save on production costs. The result is a premium towel at an economical price. The Supreme Guzzler Waffle Weave Drying Towel measures 20� x 40�. That's 5 1/2 square feet of plush fabric! It's a terrific drying towel for any size vehicle. Always dry your vehicle after washing it to prevent water spots and drip marks. Use the Supreme Guzzler Waffle Weave Drying Towel to make drying your vehicle fast and easy.